In the not-too-distant future, our fields could be tilled, sown, tended and harvested entirely by fleets of co-operating autonomous machines by land and air. And they'll be working both day and night. Driverless tractors that can follow pre-programmed routes are already being deployed at large farms around the world. Drones are buzzing over fields assessing crop health and soil conditions. Ground sensors are monitoring the amount of water and nutrients in the soil, triggering irrigation and fertiliser applications. And in Japan, the world's first entirely automated lettuce farm is due for launch next year. 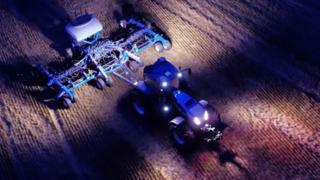 The future of farming is automated. The World Bank says we'll need to produce 50% more food by 2050 if the global population continues to rise at its current pace. But the effects of climate change could see crop yields falling by more than a quarter. So autonomous tractors, ground-based sensors, flying drones and enclosed hydroponic farms could all help farmers produce more food, more sustainably at lower cost. No wonder the agricultural robotics sector is growing so fast. One report, by US firm WinterGreen Research, forecasts that the market will grow from $817m (£655m) in 2013 to $16.3bn (£13bn) by 2020. But investment bank Goldman Sachs is far more bullish, predicting a $240bn market over the next five years. Manufacturers including John Deere, CNH Industrial and AGCO are all fighting to corner the market in driverless tractors. As well as big kit, small kit is giving farmers up-to-the-second data on the state of their fields and produce - what Dr Roland Leidenfrost of Deepfield Robotics calls the "internet of plants and fields". Bosch start-up Deepfield, based in Germany, is working to automate the growing and testing of seed crops, tracking the susceptibility to weeds and drought of different genetic varieties. Meanwhile, engineers in Shropshire, England, are trying to show it is now possible to farm a field without a human setting foot in it at all. The Hands Free Hectare project will use flying drones and automated tractors in the coming year to grow and harvest a cereal crop. Engineers from Harper Adams University - together with a North Yorkshire farming technology company called Precision Decisions - are testing prototype machines now, and aim to plant their crop in March for harvest in September. It's hard to imagine the most traditional of agricultural sectors - wine making - as needing more than natural sunshine and soil. But even here automation is encroaching. Wine makers have used drones to inspect their vineyards for several years, with high-definition cameras and sensors assessing crop and soil health. But in France's Burgundy region, a shortage of farm labour has led inventor Christophe Millot to develop a vine-pruning robot called Wall-Ye. The latest generation of this trundling four-wheeled robot can make a cut every five seconds. It has six cameras - some with infrared sensors - and two arms, and is controlled by a tablet computer inside. The machine learns as it goes and can trim the grass around each vine. An onboard solar-powered battery gives 10-12 hours of charge, so with a change of battery, it can work day and night. Visual recognition is the biggest challenge, says Mr Millot - knowing where to make the cut. This is actually easier at night, because the robot's lights can illuminate the plant, but not its background. Next year, he plans to go to California - another major wine-producing area - to market his range of winery robots there. But some people think farming land is old hat. Japanese firm Spread's automated vegetable factory in Kyoto, due to launch next year, could produce 30,000 lettuces a day, the company says. It stretches up, instead of across undulating fields, because "in countries like Japan, where land is actually a very scarce resource, it makes more sense to stack your production, just like a skyscraper," says JJ Price, Spread's global marketing manager. Everything after seeding will be done by machines - watering, trimming, harvesting - on shelves stacked from floor to ceiling. It's a bit like the solitary drone farmers in the 1972 film Silent Running. Automation has reduced labour costs by 50%, says Mr Price. And LED lighting developed specifically for plant cultivation reduces energy costs by 30%. "It doesn't matter what the weather or climate is outside," he says. And growing vegetables in vertical farms means you can recycle 98% of the water, says Mr Price, and produce food much closer to where people consume it, cutting down on transport costs and emissions. Back outside, drones are monitoring crop growth rates, spotting disease, and even spraying crops with pesticides and herbicides. Now researchers are also trying to make them co-operate and work in swarms. If they are mapping weeds in a field, say, "the drones will recruit each other to converge on those areas where the weed presence is higher," says Dr Vito Trianni of the Institute of Cognitive Sciences and Technologies in Rome. Although GPS signals are generally strong in agricultural areas, one challenge for drones and other farmland robots is coping with patchy internet and mobile connectivity. So Dr Trianni's team is using ultra-wideband radio for his drones to communicate without relying on rural 3G or 4G mobile connections. Of course, automation might promise more efficient food production, but it also threatens agricultural jobs. From 1950 to 2010, according to the International Labour Organization (ILO), agricultural labourers as a percentage of the workforce declined from 81% to 48.2% in developing countries, and from 35% to 4.2% in developed ones. Robots will surely accelerate this decline.